Wash and soak the pinto beans overnight. Drain. Combine the beans, stock and pork. Simmer for 1 hour. Saute the bacon in a saute pan; remove when crisp and reserve. Add the tomato and cook 2 minutes. Add the tomato mixture to the beans. Add seasonings and herbs and simmer 30 minutes longer. Adjust the seasoning, stir in the cilantro, and garnish with bacon. 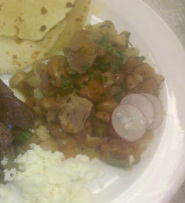 Chef:Meat should be cut the size of beans, not as directed. beans our beautifully cooked, perfect texture. Personal/Team:These were flavorful, seem like a good side for any tex-mex meal, more flavor than refried beans and a better texture. Lessons Learned: I cooked bacon at low heat to render fat and then added vegetables, and didn't remove the bacon. I think it saved the extra step and still gave more bacon flavor to the dish.